According to eMarketer, by 2017 m-commerce sales are expected to easily exceed $100 billion and reach over $113 billion. 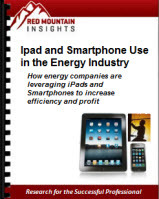 Fueled by the launch of Apple's iPad and iPhone, along with the corresponding Android smartphone market explosion, the mass adoption of mobile devices is creating huge opportunities for energy companies to leverage mobile technology to boost profit and efficiencies. A full 91% of all U.S. citizens have at least one mobile device within reach 24 hours a day. Your customers, target market, vendors, and competition are increasingly relying on them for business-related tasks. MCommerce has few global boundaries, with cellphone sales skyrocketing in once-untouchable markets like China. Companies can now reach, and sell to, markets that previously would require significant capital investment, infrastructure, and personnel to reach. With cell phone and tablet prices decreasing, and their power and capabilities increasing, enterprises will undoubtedly be adopting mobile devices at an accelerated rate in the next 6-12 months. And your competition is adopting mobile technologies to reach your customers, and increase internal efficiencies at a staggering rate. Mobile technology is much more than just the latest app downloaded to a smartphone or tablet; mobile is comprised of many technologies that are impacting everyday life and every vertical market in a variety of ways. Is your company prepared to reach your customers who are using mobile devices? Is your organization taking advantage of the portability and capabilities of ipads, tablets and smartphones internally? This report acts as your guide to understanding how to leverage the hardware and mcommerce capabilities of the global mobile market. Copyright © 2012 Red Mountain Insights . All Rights Reserved.